The Seibu Region of Japan is home to a number of very diverse landscapes and climates, from the unique sand dunes of Tottori and the snowy mountains of Hiroshima, to the rolling hills of Okayama and the golden beaches of Kochi. The diversity of the region is also reflected in its myriad local foods, cultural events and, of course, in the people. There are 26 AEON branch schools in the region, with 4 schools on the island of Shikoku. The regional Head Office is found in Okayama city. The majority of the Seibu Region schools teach both children and adults, so teachers can expect a diverse array of students, too. Seibu is split into two geographic areas, Chugoku and Shikoku. Chugoku, the westernmost part of the main island of Japan, is a mix of open plains and forested mountains. The elevation increases as one travels north, so the climate becomes cooler. Heavy snow can be expected during the winter in the Sannin region. During the warmer months, Tottori has amazing natural sand dunes. Or there is the famous singing sand on Kotogahama which squeaks as you walk across it. Okayama Prefecture, where the Seibu Head Office is located, has an abundance of grassland which produces some delicious dairy products. Its moderate climate also provides bountiful local vegetables and fruits, most notably peaches. Urban centers in Chugoku are a little smaller than those found in some of the other regions, but the cities, such as Hiroshima, are still vibrant and modern yet steeped in history. Shikoku is a separate island located to the south of Honshu and has a unique charm. The landscape is defined by mountains and steep valleys. There is some wonderful scenery, such as the train ride winding through the Iya valley in Tokushima. One can take this train all the way to Kochi on the south coast of the island. Once there, be sure to check out the surfing at beautiful Katsurahama. 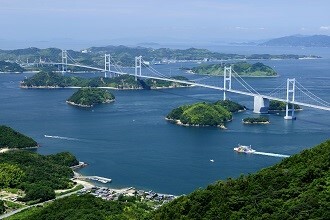 Shikoku is connected to the mainland by a number of remarkable bridge systems, such as the Great Seto Bridge in Kagawa and the Nishiseto Expressway, as well as the longest suspension bridge in the world, Akashi Kaikyo. Between these two regions lies the Seto Inland Sea, which contains almost 3,000 smaller islands. Filled with their own hidden (and not so hidden) secrets, from beach bars and kayaking on Shiraishi Island to internationally renowned contemporary art installations on Naoshima, these are well worth the time to explore. Considering the varied geography, it’s no surprise that Seibu has a wide selection of activities to fill the teachers’ free time. All towns and cities in the region will have a number of local sports clubs one can join, with soccer, volleyball and tennis being particularly popular, not to mention martial arts such as aikido, judo and kendo. For something a little less strenuous, choral groups, orchestras, or more traditional Japanese pursuits, such as flower arranging and calligraphy are also available. Coastal towns and cities offer a range of marine sports, with surfing being popular on the north coast of Honshu and south coast of Shikoku. For those who prefer their water even wilder, try the white water rafting on offer in the Iya valley. And for something completely different, go camel riding across Tottori’s sand dunes. Or just enjoy the sound of the waves on one of the secluded beaches on the Seto Sea. In winter, teachers can get their fix of snowboarding and skiing in the mountain resorts around Hiroshima and Tottori. In the cities, teachers have access to all the modern conveniences they need, but at a much more relaxed pace than the breakneck speed of Osaka or Tokyo. Cities like Hiroshima have all the right labels for the fashion conscious, or one can hunt for surprises in Okayama’s many independent boutiques. 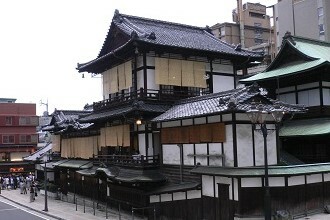 Alternatively, Matsuyama city contrasts contemporary luxury shopping with the 1000 year old Dogo onsen. Traveling is extremely popular, and Okayama acts as a convenient hub city, with most places in the region within day-trip distance. Hidden around the region are a number of villas, ranging from traditional farmhouses to modern beachfront complexes, which can be rented out for a weekend. For those looking to head out a bit farther, there are many local airports offering domestic and international destinations. The westernmost city, Shimonoseki, also has direct ferry connections to the Korean peninsula. Alternatively, Tokyo, Kyoto and Osaka are only a few hours away on the bullet train. 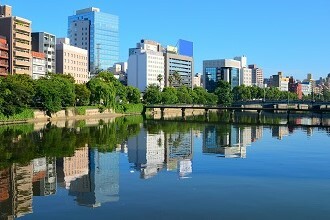 People in Seibu are proud of their unique history and culture and the region has a number of sights that can’t be missed. 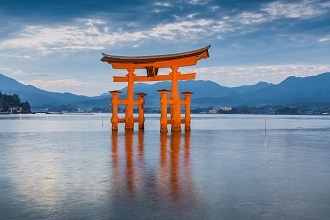 Hiroshima Prefecture is home to Itsukushima Shrine, with its famous floating torii gate, and the Atomic Dome peace park, two UNESCO World Heritage sites and certainly two of the most iconic images of Japan. The region’s third World Heritage site, Iwami Ginzan silver mine, is found in Izumo Prefecture along with one of the country’s most ancient shrines, Izumo Taisha. In Okayama city Koraku-en, one of the three most famous gardens in Japan, is a fantastic spot for photography. Or one can go all the way back to the Pleistocene era at Akiyoshidai, a vast plateau in Yamaguchi prefecture, and the site of spectacular geological formations, fossils and Japan’s longest cave, Akiyoshido. In Iwakuni one can find the remarkable Kintai Bridge, considered one of the most beautiful spots for viewing cherry blossoms in the spring. Visit Kochi to learn about Sakamoto Ryoma and his role in the Meiji revolution. Then head over to neighboring Tokushima to see the Awa Odori, Japan’s largest dance festival, which brings over a million tourists to the city. The Seibu region also has a number of local specialty dishes. As with most of Japan, seafood is extremely popular. Shimonoseki is the home of fugu, the notorious Japanese delicacy of carefully prepared puffer fish. A visit to Itsukushima isn’t complete without trying the local oysters. 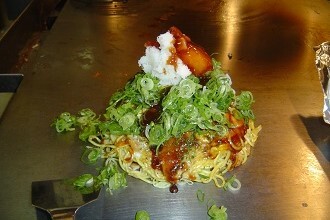 Hiroshima also has its own version of the classic dish okonomiyaki, stacked high with noodles and cabbage. Noodles are the order of the day on Shikoku with Sanuki udon, Iya soba and Tokushima ramen all being very popular. And don’t forget to try katsuo tataki, seared bonito garnished with salt flakes. This only scratches the surface of what is available in Seibu, and surprises are sure to be found at every turn in this remarkably diverse region. Click for more information about certain school locations in the Seibu region and comments from our teachers.